There was a competitive spirit in the air on May 25th, 2017, as 75 students from charter high schools across Chicago took part in a Shark Tank-style competition to see whose entrepreneurial idea would win over judges. 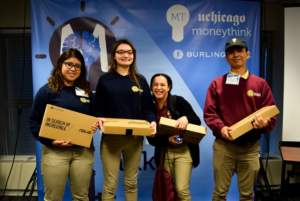 The highly successful event was sponsored by Burling Bank and The University of Chicago’s Moneythink chapter to promote financial literacy and entrepreneurship for low-income students, preparing them for a bright financial future. Students prepared for 3 months developing ideas and plans for business, making presentations, constructing budgets and gaining insight from The University of Chicago Moneythink students. Divided into 15 teams, teens competed to see which judges would “invest” in their ideas. The winning team from Rauner College Prep took home first place with their concept of iGreen, a community-based recycling initiative. Students would pick up waste from businesses for free and then sell the organic compost created from the waste product at a low cost. According to the winning team, “iGreen encourages people to spend time outdoors and gardening.” Their green thumbs paid off: each winner on the team received a brand new Google chromebook for their efforts. This is the third consecutive year the event has been held. The winning team from Rauner College Prep took home the grand prize. As a community partner, Burling Bank is pleased to help educate students from low-opportunity neighborhoods on financial literacy and entrepreneurship through Burling’s sponsorship of The University of Chicago Moneythink chapter, a nationwide nonprofit dedicated to financial education. To get involved and learn more about Moneythink’s capabilities, visit their site. Enjoy Better Online and Mobile Banking With Burling Today!